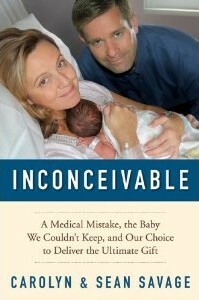 I saw Inconceivable, by Carolyn and Sean Savage, available electronically from the library. I was intrigued. The IVF mistake was simply stated: Carolyn Savage was pregnant with someone else's embryos. She and her husband Sean were forced to make a seemingly inconceivable choice: Either terminate the pregnancy, sue for custody, or deliver the baby—and relinquish it. The Savages decided to do what they would hope that another couple would do in a comparable situation. This is their story. Impossible to read without placing yourself in their situation. I kind of remember hearing about this situation on the news in the past. But, this book definitely made you think. What would we do in their situation? How does this happen? How are they able to be so strong throughout the whole ordeal? It was an interesting book to read. Overall 3.5 out of 5. I finished Winter Garden by Kristin Hannah crying. Sign of a good ending? I think so. I really enjoyed this book. All throughout I wasn't 100% sure where it was going or how it would end, but I needed to know. A definite must read. Rated 5 out of 5! This past week I read Fragile by Lisa Unger. This was my first e-book to read so I was excited. According to Goodreads... Everybody knows everybody in The Hollows, a quaint, charming town outside of New York City. It’s a place where neighbors keep an eye on one another’s kids, where people say hello in the grocery store, and where high school cliques and antics are never quite forgotten. As a child, Maggie found living under the microscope of small-town life stifling. But as a wife and mother, she has happily returned to The Hollows’s insular embrace. As a psychologist, her knowledge of family histories provides powerful insights into her patients’ lives. So when the girlfriend of her teenage son, Rick, disappears, Maggie’s intuitive gift proves useful to the case—and also dangerous. I really liked this book. It was a little confusing at first but starting about a third of the way in, I was hooked. Fragile made me wonder about people's pasts and what they are hiding from the world. Over all 4.5 out of 5. I also enjoyed reading this on my Nook Color. It was a little different to begin with... No page turning, No pretty cover to look at... but I stuck with it and enjoyed the book. I made this recipe for a quick and easy snack. 1. Heat the oven to 400F. 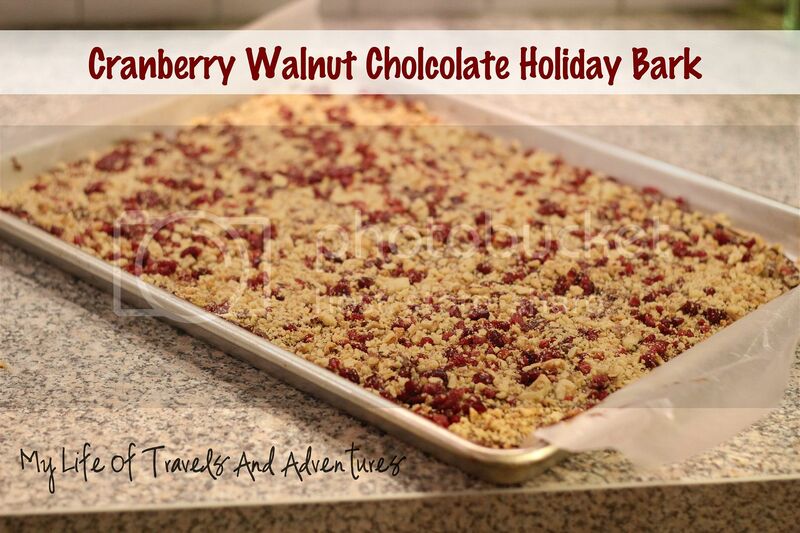 Toast the walnuts on a cookie sheet for 8 minutes. Then chop coarsely. 2. Line a cookie sheet with wax paper and graham crackers. Chop the dried cranberries. 3. Melt the chocolate chips. 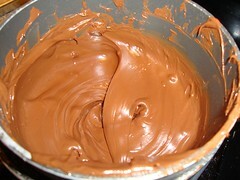 Stirring until the chocolate is smooth. 4. Smooth the chocolate over the graham crackers. 5. 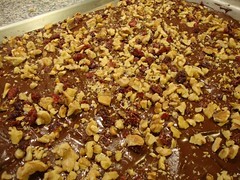 Before the chocolate cools, sprinkle with the walnuts and dried cranberries. 6. Let cool in the fridge for 1 hour. Then break into pieces. 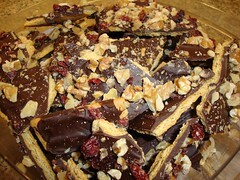 This recipe made quite a bit of the bark. You may want to half the recipe unless you want to be tempted by this yummy snack in your fridge all week. This recipe is 2 points if you break it into 48 pieces or 3 points for 36 pieces. Either way it was a yummy snack with just the right amount of sweet and salty. I finished Three Cups of Tea recently. I have seen it in the library and book store for sometime now. So I finally gave in and read this book. According to goodreads: "One day in 1993, high up in the world's most inhospitable mountains, Greg Mortenson wandered lost and alone, broken in body and spirit, after a failed attempt to climb K2, the world's deadliest peak. When the people of an impoverished village in Pakistan's Karakoram Himalaya took him in and nursed him back to health, Mortenson made an impulsive promise: He would return one day and build them a school. Although he was a homeless "climbing bum" living out of his aging Buick in Berkeley, California, Mortenson sold what few possessions he had to launch one of the most remarkable humanitarian campaigns of our time." "Three Cups of Tea traces Mortenson's decade-long odyssey to build schools, especially for girls, throughout the region that gave birth to the Taliban and sanctuary to Al Qaeda. While he wages war with the root causes of terrorism - poverty and ignorance - by providing both girls and boys with a balanced, nonextremist education. Mortenson must survive a kidnapping, fatwas issued by enraged mullahs, death threats from Americans who consider him a traitor, and wrenching separations from his family." Today, as the director of the Central Asia Institute, Mortenson has built fifty-five schools serving Pakistan and Afghanistan's poorest communities. And as this real-life Indiana Jones from Montana crisscrosses the Himalaya and the Hindu Kush fighting to keep these schools functioning, he provides not only hope to tens of thousands of children, but living proof that one passionately dedicated person truly can change the world. This is such an easy dish to make. I have made it in the crock pot as well. So it can be done both ways. 1. Cook the pasta as regularly. 2. 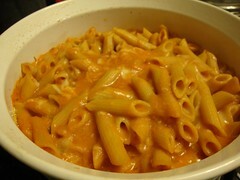 As the pasta is cooking, in a small saucepan, combine the Milk, Flour, Butter, Salt and Nutmeg. Stir to mix, then boil for 10 minutes. 4. Place into oven safe dish and bake for 20 minutes at 400F. Makes 6 servings. Each is 7 WW ProPoints.